CLEER co-hosted an EV ride and drive and educational table on Sept. 13 at the Glenwood Downtown Market in Glenwood Springs, Colo.
CLEER partnered with three Glenwood Springs auto dealerships Audi Glenwood Springs, Mountain Chevrolet and Glenwood Springs Ford, along with Garfield Clean Energy, the City of Glenwood Springs, Garfield County Environmental Health, the White River National Forest and community volunteers. 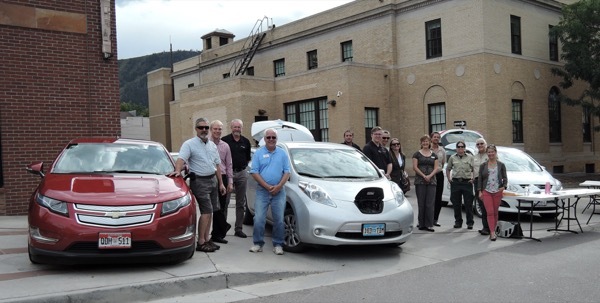 In spite of cool temperatures and dark storm clouds, the Glenwood Springs event gave 31 people a chance to drive or ride in an array of plug-in electric vehicles - the Chevy Volt, Audi A3 e-tron and Ford Fusion - and to check out five privately-owned EVs. Two CLEER staff members brought their EVs. Matt Shmigelsky showed off his Nissan Leaf, and Shelley Kaup showed her Ford C-Max Energi. White River National Forest staff showed the agency’s Ford C-Max, Frank Nadell showed his Chevy Volt, and Craig Farnum showed his Tesla Model S.
See and test-drive several models of plug-in EVs, learn about tax credits for EV purchases, and explore options for charging at home, at work and at the growing number of public charging stations across Colorado and the U.S.